A wondrous city in the United Arab Emirates - Dubai is growing on a tremendously large scale year on year both in terms of price and literal size. For the tourist Dubai offers something surreal and breathe taking in every possible way in which you could ever comprehend. It will not come as a surprise that Dubai is over taking tourism numbers of popular destinations from around the world even hugely popular places such as Florida re being favoured over. For that reason I think it will be a good idea to gather a list together of the very best restaurants in the State and share them with you. I think this list will be very special and all the exacerbated by how exotic the food on offer is. What we must remember is that Dubai was a desert 30 years ago and has now turned into a metropolis with some of the best chefs serving foods from a global scale of cuisine. The biggest question is; what will the food be like in 30 years? Well I can only imagine considering some of the places that we are going to talk about in this list. 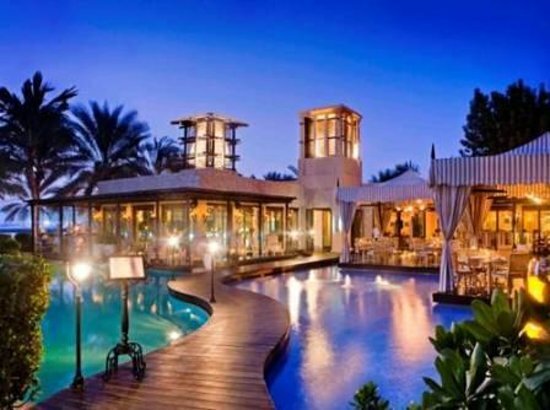 This is one of the most distinctive buildings in the United Arab Emirates, This hotel has been serving amazing food to people who enjoying there say in this world exclusive 7 star hotel. There are nice dining experiences here to enjoy – the first of which is the Culinary Flight. The Margaux provides a seleciton of tradtional French cuisine from Fine Qysters to Beef Tartar. A place for people who love Asian cuisine. The Eauzone is the perfect restaraunt for people who want to hear the calmin gsound of the ocean while enjoying some top class food. An amazing way to enjoy truely traditional Arabian cuisine. You will find that you are in an oasis away from distractions here.